As a fellow fashion stylist, Tanesha Smith’s new job sounds like a dream at Bluefly! She is the resident stylist, which means, she styles photo shoots for Bluefly. 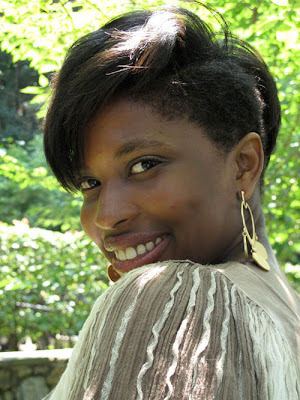 She’s also a contributing blogger on http://flypaper.bluefly.com/; and answers the style conundrums of our Facebook fans and Twitter followers when they arise. You can catch her live-tweeting the Oscar Red Carpet this Sunday on http://twitter.com/bluefly_com. I got to chat with Tanesha about what she thinks of the spring 2010 trends. Get excited about what she is doing and stay tuned for things to come. What is your personal style staple? It gets kind of grey because as a stylist and a woman that walks the earth it’s like two different mind sets. There are things I like in theory but I don’t wear…like big earrings…I love styling with them…but, personally I am always wearing something with animal prints, accessories, I love belts…it adds something always to tops or dresses…shifts the silhouette of a piece and gives it a new personality. What do you think every fashionista should have in her closet? To build a good base, every fashionista can start with a crisp white shirt and a great pair of darker washed denim. Not a second skin jean, or flare, but a transitional piece that you can dress up or down. A classic trench coat you can throw on with a pair of sunglasses. It can take you from day to night. One fantastic pair of sunglasses is always great, classic, almost square shape. It’s worth investing in a good pair so that they last longer so you aren’t buying some every six weeks. To complete any look, everyone should have a good, brown leather bag that can carry you across the board in different situations. What were your favorite shows for spring 2010 fashion week? Answering this question is like choosing between your children. It’s hard to choose one…Thinking Marc Jacobs…but, is it wearable? My body says Chloe…Marc Jacobs was beautiful, and I aspire for Celine. But, at the end of the day I would be wearing Chloe. Maybe I will wear Celine later, when I am older. Which trends stood out for spring 2010? I think I would turn to separates. I think that dresses had a long run of all anyone wanted to talk about…which I totally get. For a while it was just so easy to wear a dress…but, now an interest in separates is great. A look at leggings with style updates of leather and meshes became an event to themselves. Everything is back and made a joy to dress again and a thought to create a look and an outfit. Having more fun to play with fashion. Really experiment and have a good time with it. What looks from attendees at the tents stood out to you? Nobody needs to go to a show these days, you can look online, and there are a million ways to see the looks from the runway now. The reason to go is to see what people are wearing at the shows. It’s always fun to go and see. The Teen Vogue attendees are interesting to watch. But, there are those bloggers now like Style Bubble that are fun to check out and see what’s going on. They are fun because they inspire you to think about the things that you can have and what you can do with them…not necessarily going out and buying something new. And of course, the famous Anna de la Russo and Daphne Guiness that are like a show. Daphne is going to have an exhibit of herself at the Fashion Institute of Technology (FIT), it’s certainly something to watch. These people really garner attention in their own right. Where do you get your inspiration for your fashion choices/combos? That is fed anywhere from the shows, it all starts there and trickles down. I feel like ten years ago inspiration came from the streets. The idea that designers travelled the world and saw(how kids they interpreted fashion and trends what the kids were doing with fashion and how they were wearing things and then translating into high design. But, with so much inspiration it’s going the other way around. Now, designers are creating looks and reflecting out to the masses. I would think I would have said people around me because live in NY...but, now people really emulate runway trend. Then, there’s the international publication like Japanese magazines and their youth culture…and blogs…like, Street Peeper to see what everyone is doing since we are all so connected now and in touch with global trends. How fun is it to put together looks for Bluefly?! What’s your favorite part? The best part is to really have an idea, to carry it through and watch on set to see it happen. Only a few weeks ago it’s just a thought in your mind. Then, we collaborate between the buyers and the merch team to make it visually compelling. In some companies it can become a chore… “do we really have to shoot this thing and no one is excited”…but, we have phenomenal buyers that get us really great items with great trends and price points. Some may see this as a catalog or commercial style…but, we manage to still keep it fresh and turn it out every time and get all of our goals achieved. What are the ESSENTIALS this spring for women’s fashion? On point if you have something in leather…easy go to piece…jacket…leather sportswear ubiquitous…everywhere…leggings, skirts, shorts, shirts….not just heavy outerwear…really thin, light weight weather…for total look…can incorporate into to outfit to wear all day. Pastels light pinks and blues, minty greens and yellows….going to Marc Jacobs…washed out palette. Denim has a lot going on…dreamy, laid back, and relaxed….military or camp style detail…snaps or pockets or bungee cord…like you might be spending time outside…element of ruffles and volume running through as well…like Lanvin or D&G…mixing with the military or neutrals and incorporating it all to create interesting looks…so everyone can still look current but not look cookie cutter. What’s your in/out list for spring 2010? Not the most online savvy person…I find myself coming across blogs, but I forget how I found them…but, there are those ones I go to all the time. Rachel-stylist, Rachel Gillman her blog-really cool—its old school stuff…like Old Chanel ads and chronicling what she does…Blogs are a good way to keep up with friends. I almost would have been an interior designer because I like them a lot. I love styling…also been doing custom terrariums…I have been selling to people and doing events…I like talking to people about fashion…I would like to take that into TV.